Liam started Kindergarten! It's a big change for all of us to all of a sudden have a routine, we haven't done the same thing every day in a long time. 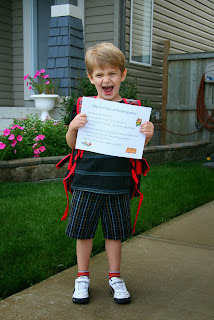 On the first Friday, Liam commented that it was "over" he thought Kindergarten was a week like camp! Liam says he doesn't want to go to school anymore. But he goes to school fine, and talks about how much he loves all the activity centres. The teacher lets us know what they are learning, for example this week is triangles. He walks around pointing out everything that is a triangle. We had our first meeting with the teacher. Liam is slow to warm up to people and new situations so it took a couple of days for Liam to speak to his teacher. Liam likely will qualify for some in class OT to work on his pencil skills. He's come a long way, but I want him to get some extra help to continue his progress. He may also qualify for in school PT. In gym, the teacher asked the kids to hop 12 times in a row, and Liam was the only kid in the class who did it! We had our 6 month follow up appointment with Dr Lucie. At this point, appointments are pretty fun and relaxed after having a clean MRI and lumbar puncture. They did the usual neuro tests that they do with his physical exams. All Liam's blood counts are very good. To everyone's surprise, the hydrocephalus has decreased slightly. After increasing every 3 months since December, they were expecting a trend of increase to continue. Thankfully we don't have to face surgery or a shunt for now. It is still more fluid than "normal", but he may just adjust to that level and we just hope for no more increase. May 13, 2013 14.9kg/33 lbs 104.3 cm/3'5"
May 23, 2012 15.2kg/33.5 lbs 99.3cm /3'3"
Liam is eating more food, but has only added a couple new foods to his repertoire of 10 foods. He is still just eating the same things every day. But, we are not adding whipping cream and oil to his foods any more, it is positive that he gained some weight with what he is eating. Many kids will take appetite stimulant, so it's great that we haven't had to do that. To give you an idea about how resistant Liam is to new foods. We are always trying, with no success to get him to try something new. No amount of bribery/reward has any effect. But, we did have success recently, we decided to try to get Liam to try pizza. Before diagnosis, Liam would eat sausage and cheese pizza. We got sausage and cheese pizza (nothing else), and explained to Liam that he has eaten it before. We picked a tiny piece of sausage off of the pizza. Liam spent 5 minutes looking at the sausage, with a few touches to his tongue. After 7 minutes, he took the tiniest bite possible. After 10 minutes, he ate half of a tiny piece of sausage. After 15 minutes, we cut a tiny piece of the pizza crust and he ate it with the sausage. In the end, a HUGE success, he actually ate a few bites of pizza!! It was a big surprise to us that he tried it. We have no idea what factors were aligned to get him to try it that day. When doing the neuro exercises, Dr Lucie observed Liam doing his head tilt still and suggested that he should get checked for double vision. We went to an optometrist and sure enough he has an eye misalignment, which leads to double vision when he's tired. He tilts his head to compensate. (not uncommon with brain tumours, may be due to the pressure on his brain) It wasn't conclusive (he lost patience with the tests), but it also appears that he may not be able to see 3D. The news I hated to find out is that Liam has to be re-vaccinated for everything. Initially we were told that Liam did not have to be re-vaccinated, but the information was based on a different protocol. We got the info from the right source, and the conclusion is that he has to have all of vaccinations done again. He's going to lose his mind getting this many needles. How nice it would be if Liam could just have some medical free time.